As dentists, we get used to changing methods, products, and materials as there are always new advancements in the field. Of course, we all have a healthy dose of skepticism anytime new technology promises to change our lives for the better. We can be especially opposed to changing up methods and materials we’ve used throughout our careers. We’re here to help you sort out false promises from the actual benefits of new advancements in dentistry. You’ve probably heard that acetal resin is becoming a widespread material in dentistry. Below we’ll evaluate if and how this material can be used to improve dentures and other restorations. Let’s start at the beginning. In 1971, scientists proposed that acetal could be formed into an unbreakable thermoplastic resin. During this time, Rapid Injection Systems were able to develop the first natural tooth colored clasps with thermoplastic polymers. Dentists soon found that acetal resin was much superior as they did not need periodic tightenings and the their patients loved the natural tooth color. 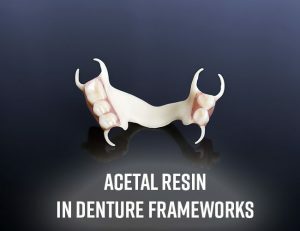 In the 1990s, acetal resin began being mass produced for use in denture frameworks. As dentists, we know that patients want to avoid putting metal in their mouths. The esthetic value of a tooth-colored material is undeniable. However, alloy materials are tried-and true. Can we expect the same function we’re used to? The short answer: yes. In fact, studies have found that acetal resin even has a superior retention to some metal alternatives. The material has a stiffness similar to a 15-mm-long and 1-mm-diameter cast Cobalt-Chrome clasp. The acetal resin clasp must be 5 mm shorter but have a greater diameter of around 1.4 mm. Compared to Co-Cr, resin has a low modulus of elasticity. This means they can be used in larger undercuts and exert less stress on abutment teeth. Acetal resin is also a great alternative for patients who may have a metal allergy. Overall, resin is advantageous in clinical situations where periodontal health and esthetics are a priority. How are resin frameworks made? CAD design software is used to design the framework and then it is milled out using milling machines. The resin clasps engage the origin of the undercut rather than the terminal third to allow three to four times the retention of metal. In addition to a superior esthetic color, the resin clasps can be placed more gingival, further increasing its natural appearance. Acetal resin can also be used for tooth shaded clasps on acrylic partials as well as a single and two tooth posterior unilateral partials. The latter situation is a great way to make an interim partial for a patient having implants placed. For these reasons, we believe in recommending acetal resin to other dentists and our customers. It’s a strong, versatile material that has proven to be superior to using metal clasps and frameworks. 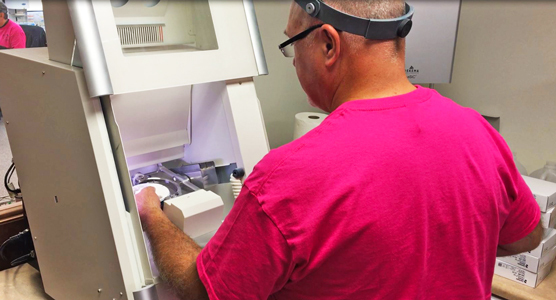 At First Choice Dental Lab®, we are committed to researching and finding the best products for our dentists. Call us at 866-791-7025 or visit our website and learn more about how we can help you give your patients a beautiful smile.